BTC/USD remains in a range-bound market in the long-term outlook. $3462 in the demand area was the low of the week attained on 22nd January while $3570 in the supply area was the high of the week. This was attained on 26th January. With the new trading week starting as a hammer, it suggests a possible trend reversal within the range and the bulls are staging a return. BTC/USD is in consolidation and trading between $4370 in the upper supply area and at $3470 in the lower demand area of the range. A breakout at the upper supply area or breakdown at the lower area may occur so patience is required to allow this to happen before a position is taken. The bearish pressure remains strong as momentum for the journey down south is building up. The ending week saw Ethereum down to $107.51 in the demand area on 20th January. Although the bulls attempt to push the price back up, it was rejected at the 10-EMA area. Exhaustion to the bullish momentum was seen as the new week began with ETH/USD briefly up at $122.00 in the supply area but ended the day a gravestone doji on 26th January, an indication of further strong bearish pressure. The price is still below the EMAs crossover and already down to $112.16 in the demand area. The stochastic oscillator signal points down at 26%. This suggests a downward momentum in price. $85.75 in the demand area is the bears’ target in the long-term. The ETH/USD pair is currently in the bearish trend zone. The ETH price has an opening balance of $136 in the month of January 2019. The crypto was in a bullish trend as it reached the high of $165.86. However, the ETH price fell because of the resistance at $162. 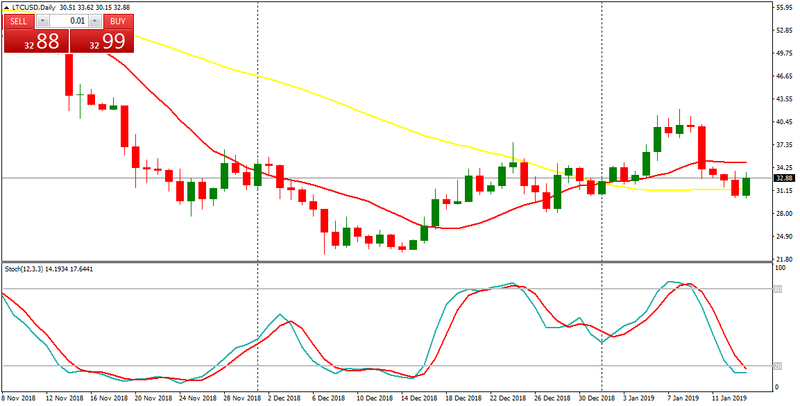 On January 10, the bears completed the bearish movement as the 12-day EMA and the 26-day EMA were broken and the price fell to the low of $129.50. On January 13, the crypto depreciated further to the low of $117.94. Today, the crypto is presently ranging below the EMAs. The crypto is currently trading at $117.41 as at the time of writing. On the downside, the crypto cannot rise above the $120 price level. On the upside, the bulls have to break the EMAs and the price sustained to reach the highs of $130 and $160. Meanwhile, the MACD line and the signal line are below the zero line which indicates a sell signal. The crypto’s price is below the 12-day EMA and the 26-day EMA which indicates that price is in the bearish trend zone. BTC/USD continues in a range-bound market in the long-term outlook. The bears had a momentary hold of the range as BTC/USD made a low of $3570 while the bulls took the cryptocurrency initially to a high of $3799 and later to $3882 as the week ended on19th January. Momentum to the downside remains strong. With the price below the 10-EMA and the stochastic oscillator in the oversold region and its signal pointing down at 14 %. The new trading week started on a bearish note with BTC/USD opened at $3762. The lower demand area of the range may be tested as the bearish momentum increase. BTC/USD is in consolidation and trading between $4370 in the upper supply area and at $3470 in the lower demand area of the range. A breakout at the upper supply area or breakdown at the lower area may occur hence patience is required to allow this to happen before a position is taken. The head and shoulder pattern is the cryptocurrency structure in the long-term outlook. The bulls attempt continue the journey up north at $134.50 in the supply area was rejected by the 10-EMA on 14th January. The formation of a bearish railroad on 15th January was an indication of the bears taken over of the market. Increased momentum led to a drop in ETH/USD to $107.51 in the demand area. 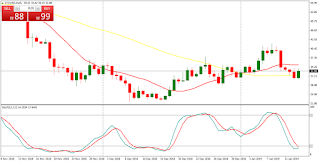 The price is below the EMAs crossover and the stochastic oscillator is in the oversold region at 16% an indication of downward momentum in price as the right leg of pattern forms in the week ahead. Google (Alphabet Inc.) shares are a rough market. There is nothing attractive about this market at the present, and the situation may remain the same until demand and supply really go out of balance. (NASDAQ:GOOG) has 4 EMAs placed on its chart, and they are EMAs 10, 20, 50 and 200. The color that stands for each EMA is shown at the top left part of the chart. Recently, all the EMAs were trending downwards… But things have changed. The EMAs 10, 20 and 50 and sloping upwards right now. Once the 3 EMAs cross the EMA 200 to the upside, staying above it, there would be a confirmed “buy” signal, which may be valid for the rest of this year. Should price fail to go above the EMA 200, this expectation would not be valid. S&P 500 market (SPI:SP500) looks promising for a great bullish run this year. There was an uptrend in the market until October 2018, when price began to plunge heavily, reaching a yearly low in December and bouncing upwards to resume a nice bullish movement. Where price bounced upwards, it was seen that it successfully closed above the upper Trendline, as price journeys further north. The RSI period 14 is in the overbought region, and may soon become very overbought as it goes above the level 80, targeting the level 90. Yes, there is a rise in the bullish moment which will eventually result in a Bullish Confirmation Pattern and play out for the most part of this year. The market may thus target the distribution territories at 2800, 3000, and 3200. The BTC/USD pair is now in a bearish trend zone. On December 14, the BTC price reached its low at the $3,200 price level. On December 24, the crypto traded and reached the high of $4,400 price level. The price of Bitcoin had been range bound between the levels of $3,200 and $4,400 in the last one month. Presently, the crypto’s price is below the 12-day EMA and the 26-day EMA which indicates that Bitcoin is likely to fall. The BTC price is currently trading above the $3,700 price level. Nevertheless, if the bears break below the $3,500 price level, the crypto is likely to find support at the $3,200 price level. On the upside, the bulls will first break the 12-day EMA and the 26-day EMA to resume its uptrend movement. Meanwhile, the stochastic is in the oversold region but above the 60% range. This indicates that the price of Bitcoin is in a bullish momentum and a buy signal. Also, the MACD line and the signal line are below the zero line which indicates a sell signal. BTC/USD remains in a range-bound market in the long-term outlook. After a push to $4218 in the supply area, the bulls lost momentum and a gradual drop in price happened until the 10th January when the bears’ takeover of the range was confirmed with a large bearish engulfing candle. BTC/USD dropped to $3686 in the supply area. Momentum to the downside is strong as confirmed by the stochastic oscillator signal pointing down at 12% in the oversold region. BTC/USD is already down at $3850 in the demand area in the first day of the trading week as the journey toward the lower price continues. Several wicks of the daily candle at the $165.00 area confirmed it as a key supply area. The wicks signal to rejection for upward price movement and bullish exhaustion with the bears making an inroad to the market. Confirmation to the bears’ full takeover of the market came with a large bearish engulfing candle on 10th January. ETH/USD was down to $125.71 in the demand area with a break of the two EMAs. The journey to the low attained on 14th December at $83.00 in the demand area, may have started because the week opened bearish with the Ethereum already down to $117.07. Every NETELLER seller is now our VIP, till February 15, 2019! This is an unusual bonanza! You can now sell Neteller at N335/$. This rate is valid for all sellers, and our VIPs and Instaforex.com customers. As long as you sell @least 100 USD, you qualify. All Access Bank customers get a flat rate of N335/$, no matter the amount they sell. If you sell below 100 USD, you get only N330/$. The minimum you can do per transaction is 20 USD. However, we buy Neteller only from our verified customers. To get verified, please sign up at: www.instantforex.com.ng and upload the required documents in the right formats. Please sell as much Neteller as you have right now.., especially to get more Naira cash for your personal needs, because we will lower the price to N320/$. You can trust us that we will lower the price after this promo. If you sell a minimum of 500 USD Neteller in one transaction, you will get a free recharge card of N500 (any network of your choice). If you sell a minimum of 1000 USD Neteller in one transaction, you will get a free recharge card of N1000 (any network of your transaction). Note: The free recharge cards are not automatically given. You need to claim it after you qualify for it. Just send us an SMS, email or IM, and write “I want my recharge card, and mention your network of choice (Glo, MTN, 9Mobile or Airtel). And you will get it ASAP. If you don’t claim your recharge card, you may not get it. THIS PROMO ENDS ON FEBRUARY 15, 2019. The price of Litecoin had been in a bullish trend since December 16, 2018. On January 1, the crypto’s opening price had risen to the high of $30.99. On January 8, the crypto’s price had reached the high of $40 but the bulls could not break the resistance at that level. On January 10, the bears broke the 12-day EMA and the 26-day EMA to the low of $33 price level. However, from the weekly chart or the daily chart, the crypto’s price is below the 12-day EMA and the 26-day EMA which indicates that price is likely to fall. If the bearish pressure continues, the crypto will fall to the low of $30. However, if the bears break this level, then the crypto will find support at the $23 or $28 price level. Meanwhile, the MACD line and the signal line are below the zero line which indicates a sell signal. The stochastic indicator is out of the oversold region but above the 60% range indicating that the price of Litecoin is in a bullish momentum and a buy signal. 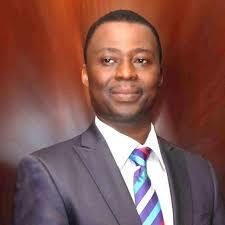 Dr. Daniel Kolawole Olukoya is a great man of God. I believe in his calling, ministry and messages. His sermons and teachings have blessed millions of lives, and he’s kind-hearted and exemplary. However, some idiots who are known as scammers are doing everything possible to use the name of this great man of God to dupe innocent people. Announcing the official Facebook page would have encouraged those who have criminal energy to renew their efforts (energies that could have been channeled into productive activities). Certain part of these professional scammers are also members of MFM. Yes, I’m sure of this. Long before this, criminals have been creating fake Facebook pages purporting to belong to Olukoya and they use that to dupe people, asking for donations towards various causes. Many unwary but generous people have paid “fool’s money” only to know later that they’ve been duped. MFM church has invariably issued warnings to people alerting them to this kind of scam..
Now scammers have designed/can design fake Facebook pages (with lots of effort), making them look like the real official page. The list and options are endless…. Honestly. NEVER EVER SEND MONEY TO ANYBODY, GROUP, ACCOUNT OR ORGANIZATION FOR ANY REASONS WHATEVER. No matter their claims, prayers, efforts, causes, proposals, announcements, needs, conditions, wants, appearances, appointments, etc. Do not send money to anyone whatsoever. If they make it appear like a matter of life and death, do not send any money or anything to them. If you want to donate to anything relating to MFM, please visit the nearest MFM church and book an appointment with their pastor and request for the best ways to donate to MFM, whether the branch or the headquarters. They will guide you in the best way to do so. A word is enough for the wise. Will MC Oluomo survive his injuries?